Klaxxon's appearance after merging his aural form with Bender's mother. Klaxxon was an entity that was originally composed of soundwaves from podcasts from the 21st century. He almost tore the Earth apart in 2017, but the Planet Express crew stopped him. After this, he was merged with Bender's mother, which gave him a body, but diminished his powers. In 3017, the Planet Express crew made a routine delivery to Junkleon 7, the deleted file planet. On Junkleon 7, Bender picked up a device that stored discarded podcasts, without knowing what it was, and stored it in his chest compartment. 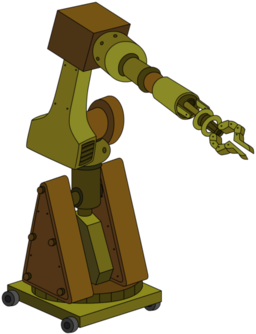 Once on Earth, Bender learned that his mother only had a few days left to live, and he wanted her to hear him reprise his character of Antonio Calculon Jr. on the All My Circuits podcast. However, the podcast audio from Bender's chest compartment interrupted his scene. The audio was too strong to contain, and eventually it escaped, becoming a being of pure soundwaves, and began to refer to himself as Klaxxon. Klaxxon left the studio, but his podcast audio eventually threatened to shake the Earth apart. So, the Planet Express and Bender's mom, on the verge of death, sought Klaxxon down to entrap him in diamondium. They found him, thanks to Leela pinpointing the location of his signal back at the Planet Express headquarters, however Bender couldn't squeeze hard enough to trap him inside. Bender's mother was able to seal most of the audio inside the shell, however due to the fact that she was weakened from being near death, a portion of Klaxxon was able to escape into her casing. This caused Bender's mother to be reinvigorated, and allowed her to speak for the first time, using a female voice mixed with that of Klaxxon. This effectively made Klaxxon Bender's stepfather, which pleased Bender who viewed him as a super villain. This page was last edited on 18 September 2017, at 08:46.